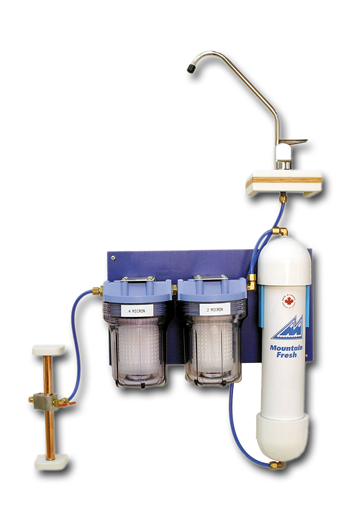 Laboratory grade (thermoplastic polymer) polypropylene filter designed to remove sediment, dirt, rust and particulate matter. Most standard water filters use either a 1 or a 5 micron filter. A filter with a rating of 1 micron can get rid of particulates around 20 times smaller than can be seen by the naked eye, while a filter that has a micron rating of .4 can remove particulates that are around 50 times smaller than what can be seen by the naked eye. Anything 1 micron rating or below will inhibit Cryptosporidium and Giardia as the cysts are larger than this in size and cannot be pushed through the filter. Laboratory grade (thermoplastic polymer) polypropylene filter results in ultra clean water. This filter is in place to act as both a back-up should the .4 filter fail due to overuse and to protect the carbon bed to increase efficiency and life. This filter can also be modified for bacteria removal for non chlorinated water. Ask us for details. Silver infused, premium organic coconut granular activated carbon, is designed to remove chemicals, taste and odor from the water while leaving in beneficial minerals. The silver bonded to the carbon will inhibit bacteria growth in the carbon filter. Activated carbon is a sorbent used to remove a variety of chemicals from water most notable, chlorine and is prepared by the pyrolysis of organic coconut shells in a closely regulated atmosphere. Coconut based carbon is the best type of carbon for water purification because of it's low ash content, suitable pore size and sharp pore distribution.